Which sign means that there may be people walking along the road? Which sign means that there may be people walking along the road? 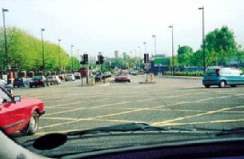 In this article we’ll look at common signs and road markings in the UK which you will need to know for your Highway Code theory test. A red traffic light always means stop, even temporary ones at traffic lights, and you must stop behind the white line or where otherwise indicated. A red light will be followed by a red and amber light. Try to adjust your speed if you know the traffic light phasing so that you avoid unnecessary braking and accelerating. Wait for the green until you proceed, and only if the exit is clear. The white line is generally positioned so that pedestrians have room to cross in front of the waiting vehicles without becoming an obstacle to traffic travelling across the junction. It can be overridden by the directions of a police officer. You might see the following flashing red lights at lifting bridges, level crossings and fire stations. If red lights continue to flash at a railway level crossing even when the train has passed, you must wait. Another train may still be coming. Only proceed once the lights have stopped flashing. This signal shows a green light with a white light showing that the tram must stop. An amber traffic light on its own means stop at the stop line as red will appear next. Stop unless you have already crossed the stop line or you’re so close that pulling up might cause a collision. If the lights are out of order then proceed with caution as nobody has priority at the junction. A white line with short gaps is a hazard warning marking. The centre of the road is usually marked by a broken white line, with lines that are shorter than the gaps. When the lines become longer than the gaps this is a hazard warning line. Look well ahead for these, especially when you are planning to overtake or turn off. If the double white line is continuous down the centre of the road on your side, you are allowed to cross the line to pass a stationary vehicle, or a pedal cycle, horse or road maintenance vehicle travelling at 10mph or less. 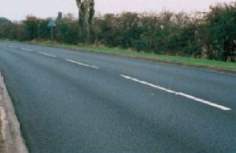 Solid white lines are placed where it would be dangerous to overtake. You may also cross the solid line to enter premises or a side road. You can park on the left opposite these road markings to pick up or drop off passengers. 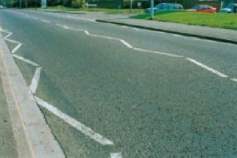 A white line along the edge of the road shows the edge of the carriageway. Diamond shaped signs painted on the road give instructions to trams – in the example below it’s a tram speed limit of 30mph. You need to show caution when driving in areas where trams operate. You may not hear their approach and they cannot change direction to avoid you. There may also be crossing points where you will need to give way to them, or areas specifically reserved for trams which you are not allowed to enter. Red routes tell you that special waiting restrictions apply. The main types of ‘Red Route’ controls are: double red lines (no stopping), single red lines, parking boxes and loading boxes (red and white). Red loading boxes allow up to 20 minutes for loading outside of rush hours. White loading boxes allow up to 20 minutes for loading at any time during the day. The hours of operation of red routes vary from one area to another. They were introduced to help keep traffic moving by stopping vehicles parking that might obstruct the traffic flow. This reduces fuel consumption and pollution. Some junctions are marked with advance stop lines to allow cyclists or buses space to be positioned ahead of traffic. When the green signal shows it allows them time and space to move off in front of the following traffic. This triangle marking appears just before a give way sign. Zigzag lines before a pedestrian crossing mean no parking at any time and no overtaking the leading vehicle. Yellow crisscrosses on the road indicate that you should not queue across a junction. This is a box junction and you should only enter is if your exit is clear. You can wait in the box junction if oncoming traffic is preventing you from turning right. Centre median strips are marked to separate traffic flows. 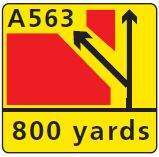 Areas of ‘hatched markings’ such as these are to separate traffic streams which could be a danger to each other. They are often seen on bends or where the road becomes narrow. If the area is bordered by a solid white line, you must not enter it except in an emergency. 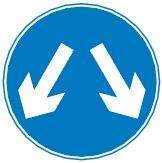 These markings might be seen when coming up to a bridge which is arched, meaning that tall vehicles need to travel in the centre of the lane. 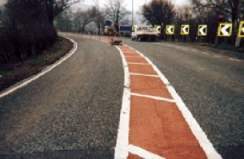 Junctions can also be marked with curve lines, like on a mini-roundabout. The broken line means you should give way to your right. Warning signs are mostly a red triangle with words and/or images inside. They show you are approaching hazards such as the road narrowing, a low bridge, children crossing, or a T-junction. When there are overhead electrical cables, tall vehicles should take care. Road works vehicles should also be aware of the cables as tipper trucks, cranes and other machinery that can extend into the air can come into contact with the cables. Bells hanging across the road also warn of overhead cables. They might also be shown with a height. T-junctions can sometimes have priority turns. This particular sign shows there is a T-junction with priority over vehicles from the right. There is a crossroads ahead. The priority through the junction is shown by the broader line. You need to be aware of the hazard posed by traffic crossing or pulling out onto a major road. Two-way traffic crosses a one-way road. Be prepared for traffic approaching from junctions on either side of you. Try to avoid unnecessary changing of lanes just before the junction. When there’s two-way traffic this sign will be displayed. 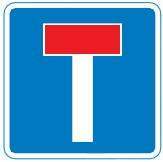 It may be at the end of a dual carriageway or a one-way street and is there to warn you of oncoming traffic. Queues are likely. Check your mirrors and reduce your speed. Exercise patience when you are delayed. Understand that annoyance and frustration lead to a poor attitude on the road and ultimately may lead to a collision or incident. Loose chippings ahead. The sign is usually accompanied by an advisory speed limit. Vehicles travelling too fast for the conditions can throw up chippings or stones which can hit pedestrians and cyclists, and damage vehicles. Avoid causing damage to paintwork and windscreens by showing consideration. There’s a roundabout ahead. As you approach a roundabout look well ahead and check all signs. Decide which exit you wish to take and move into the correct position as you approach the roundabout, signalling as required. Give way to your right. If there’s a risk of ice you might see this sign. There’s a hazard ahead. This sign is there to alert you to the likelihood of danger ahead. It may be accompanied by a plate indicating the type of hazard. Be ready to reduce your speed and take avoiding action. Where a stream crosses the road is a ford. Slow down and remember to dry your brakes afterwards. Humps in the road are ahead. These have been put in place to slow the traffic down. They’re usually found in residential areas. Slow down to an appropriate speed. There’s an uneven road surface ahead. Take extra care if you are pulling a trailer or driving a vehicle carrying a load as the load can shift. Short wheelbase unladen heavy vehicles can bounce easily over uneven surfaces. Humpback bridges are often narrow, so beware of traffic coming towards you and pedestrians and cyclists on the bridge. Long vehicles are at risk of grounding on some bridges. A steep decline or incline is ahead. Prepare to alter your speed and gear so that you avoid brake fade, your load shifting, or passenger discomfort due to weight transfer. Looking at the sign from left to right will show you whether the road slopes uphill or downhill. When a dual carriageway ends and the lanes merge to form a single carriageway, this sign warns of it. Don’t leave moving into the left-hand lane until the last moment. Plan ahead and don’t rely on other traffic letting you in. There’s a cycle route ahead. Watch out for children on bicycles and cyclists rejoining the main road. Be careful of steep banks and slippery surfaces that lead to water. A tunnel is ahead. When approaching a tunnel switch on your dipped headlights. Be aware that your eyes might need to adjust to the sudden darkness. You may need to reduce your speed. 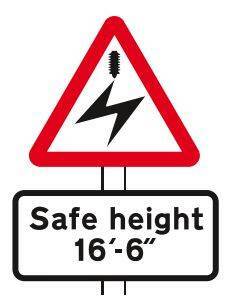 Check any height or width limits that accompany this sign if you are driving a large vehicle or towing a trailer. If no height is shown the headroom under a bridge or tunnel is at least 5m. The distance to the tunnel might be shown. Note, this isn’t the length of the tunnel, it’s how far ahead the tunnel is. A level crossing with a barrier arm or gate is ahead. Some crossings have gates but no attendant or signals. You should stop, look both ways, listen and make sure that there is no train approaching. If there is a telephone, contact the signal operator to make sure that it’s safe to cross. A zebra crossing is ahead. Where you have to give way to trams you will see this sign. If you don’t usually drive in a town where there are trams, remember to look out for them at junctions and look for tram rails, signs and signals. 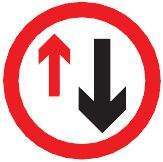 Lorry drivers will use these signs when the load overhangs the front orrear of the vehicle by more than two metres. They are also used for wide loads of over 2.9m. They need to be independently lit at night and must indicate the actual position of the wide or long load. Concealed level crossings are given countdown markers in red and white. If a diversion is in place you can follow signs like these. Major roadworks often cause complicated diversions for large vehicles. Drivers may be advised to follow a special symbol until the original road is rejoined. Look for the yellow and black square, triangle, diamond and circle symbols combined with additional information, to help you rejoin your route. 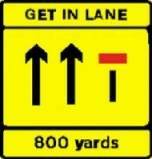 This sign shows that the right hand lane is closed in 800 yards. Yellow and black temporary signs may be used to inform you of roadworks or lane restrictions. Look well ahead. If you have to change lanes, do so in good time. Roadworks might also restrict where heavy vehicles can travel. Lanes at roadworks often carry weight restrictions to keep larger vehicles in the left-hand lane. The width of the lanes through the roadworks are very often narrow and therefore not wide enough for large vehicles to pass each other safely. 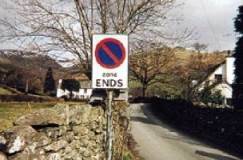 Always look for restriction signs at roadworks. They are usually placed well in advance to give you time to move safely into the correct lane in good time. In roadworks areas signs can show the distance to the next exit where it might not be clear from road markings alone, the junction is obscured, or if the exit has shifted. Contraflow systems at roadworks are shown like this. If you use the right-hand lane in a contraflow system, you’ll be travelling with no permanent barrier between you and the oncoming traffic. Observe speed limits and keep a good distance from the vehicle ahead. Tourist signs are brown with white writing and icons. Location signs can give multiple locations and warn of approaching hazards. In the case of the sign below, there is a restricted height on the fourth exit, therefore large vehicles will need to take note. Signs giving orders are mostly red circles with words or an image inside. Sometimes certain vehicles are prohibited from some roads and areas. The three signs below shows that buses, motorbikes or cars are prohibited. If only one of them is shown then the others are permitted. This sign shows that motor vehicles are prohibited. On a weak bridge vehicles over a certain weight might be prohibited. An alternative route must be found. Plan your route in advance to avoid delays and congestion. This will save time, fuel and frustration. You must know the weight of your vehicle, including any load. 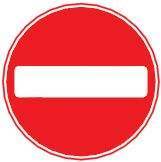 When you are not allowed to enter a road you will see this sign. It could be, for example, a one way street exit. When a particular direction is prohibited you’ll see a sign like this one which indicates you are not allowed to turn right. There’s a double bend ahead. 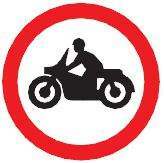 If overtaking is prohibited you will see this sign, possibly along with road markings such as a solid white line. Traffic coming in the other direction has priority. Be prepared to stop and give way. The following sign means that waiting restrictions apply. There will be an additional plate telling what kind of restrictions apply. 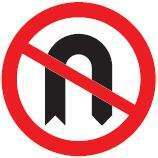 When waiting restriction end, these types of sign indicate that. This sign means no stopping is allowed even to pick up or drop off passengers, unless it’s in a lay-by. 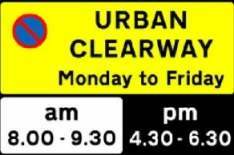 For clearways with time restrictions a sign such as the one below is shown. It is in force from 8-9:30am and 4:30-6:30pm Monday to Friday. Outside of those hours stopping as allowed as per any other restrictions that might be posted. Speed limits are indicated by a number in a red circle. 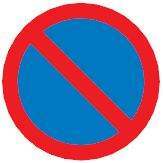 The sign below gives you an early warning of a speed restriction. If you are travelling at a higher speed, slow down in good time. You could come across queuing traffic due to roadworks or a temporary obstruction. If you’re in places where there are likely to be pedestrians such as outside schools, near parks, residential areas and shopping areas, you should be extra-cautious and keep your speed down. Many local authorities have taken measures to slow traffic down by creating traffic calming measures such as speed humps and reduced speeds such as the 20mph limit shown below. 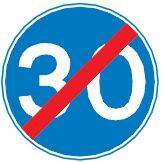 When a 20mph zone ends and the speed limit becomes 30mph the following sign will be shown. 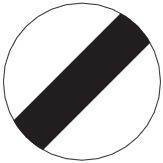 At the end of a restricted speed limit, you might see the following sign which indicates that the national speed limit applies. Get to know the shape of signs at critical points in the road so that even if they are covered by snow and ice, or not clearly visible due to dirt, fog or heavy rain, you know what they mean. For example, this sign is obviously a stop sign even though the writing is obscured – it’s the only sign that is octagonal. If there is a stop sign, you must stop. If your view is restricted at a road junction you must stop.Don’t emerge until you’re sure there’s no traffic approaching. Signs with blue circles give a positive instruction. 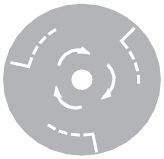 These are often found in urban areas and include signs for mini roundabouts and directional arrows. The sign below shows a route for trams only. Avoid blocking tram routes. Trams are fixed on their route and can’t manoeuvre around other vehicles and pedestrians. Modern trams travel quickly and are quiet so you might not hear them approaching. Minimum speed signs are shown in blue circles with white numbers. 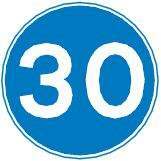 When the minimum speed limit ends this will be shown. There is a turn left ahead. You can pass either side of this obstacle to get to the same destination. It might be seen on a traffic island or in one-way streets that have more than one lane. 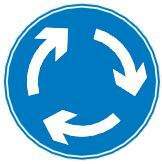 Mini roundabout ahead. 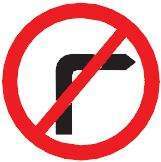 When you see this sign, look out for any direction signs and judge whether you need to signal your intentions. Do this in good time so that other road users approaching the roundabout know what you’re planning to do. The following sign shows that you have the right-of-way over traffic coming towards you. But don’t force your way through if oncoming vehicles fail to give way. If necessary, slow down and give way to avoid confrontation or a collision. There is a contraflow bus lane, i.e. the bus is coming towards you on your right. There will also be markings on the road surface to indicate the bus lane. You must not use this lane for parking or overtaking. With flow bus and cycle lanes are shown like this. Buses and cycles can travel in this lane. In this case they will flow in the same direction as other traffic. If it’s busy they may be passing you on the left, so watch out for them. Times on the sign will show its hours of operation. No times shown, or no sign at all, means it’s 24 hours. 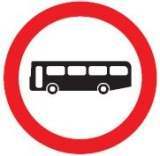 In some areas other vehicles, such as taxis and motorcycles, are allowed to use bus lanes. The sign will show these. Park and ride systems are signalled using signs like this. To ease the congestion in town centres, some cities and towns provide park-and-ride schemes. These allow you to park in a designated area and ride by bus into the centre. Park-and-ride schemes are usually cheaper and easier than car parking in the town centre. 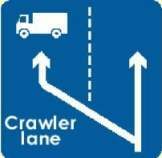 Crawler lanes are for slow vehicles on long inclines on the motorway. Heavy and slow vehicles will get advance warning of the lane and should use it to avoid holding up other traffic. There road on the left is a dead end. If you intend to take a left turn, this sign shows you that you can’t get through to another route using the left-turn junction ahead. Whereas this sign shows that there’s a dead end ahead. The motorway ending will be indicated like this. When you leave the motorway make sure that you check your speedometer. You may be going faster than you realise. Slow down and look out for speed limit signs. 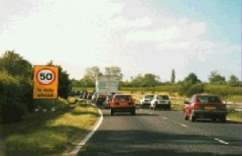 For more information about driving on motorways and what to expect, see this article. Parking-related signs are usually blue rectangles with white writing. The sign below shows that parking is one mile ahead. 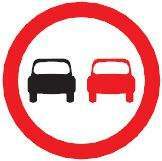 If this sign is displayed then vehicles can park fully on the verge or footpath. In order to keep roads free from parked cars, there are some areas where you’re allowed to park on the verge. Only do this where you see the sign. Parking on verges or footways anywhere else could lead to a fine. Solo motorbike parking is indicated with this sign. If the parking is pay-only, then it will be indicated. In this case pay parking applies Monday to Friday 8:30am – 5:30pm and Saturday 8:30am to 1:30pm. When giving an arm signal, signal before the turn, but not during the turn; you need both hands on the wheel or handlebars for full control of the vehicle. Give arm signals where you think that your indicators might be difficult to see, e.g. during sun dazzle. Arm signals to indicate direction should be given with a straight arm if on a motorbike. 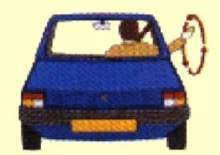 When in a car, it’s more difficult to indicate left using hand signals, so you can use this sign.